THE #1 SELLING STEROID ALTERNATIVE BULKING SUPPLEMENTS. How to Take: Use 1-3 Capsules per Day depending on your desired result. Take each dose 4-6 hours apart. (NEVER TAKE ALL 3 CAPSULES AT ONCE). Take each dose with a full glass of milk (or it can be taken with a milk based protein shake). Users report gaining as much as 12-25 lbs. in only 30 days while using this powerful legal steroid. This legal steroids influence on IGF1 and IGF-2 make it highly anabolic during super-high intensity training. Whether you are a football player that needs to gain weight during those strenuous double-day training sessions , or if you are a competing bodybuilder. Dianadrol® is taken alone, no liver guard is needed. PCT: A mild post cycle therapy is recommended with most legal steroid cycles, HOWEVER, it is certainly not needed with Dianadrol™. This particular legal steroid delivers its anabolic effects through IGF-1 and IGF-2 receptors, therefore it’s influence on testosterone does not negatively effect your hormonal balance in any significant way. Dianadrol®, you can simply taper your dose down during the last 2 weeks of your cycle. If you are taking 3 capsules a day, the last 2 weeks of your cycle you can drop down to taking only 2 capsules daily for 1 week by taking 1 capsule about an hour before you workout, and the second with your meal after you train. During the final week of your cycle you can take 1 capsule immediately after training with either a full glass of milk or protein shake for maximum absorption. Legal Disclaimer: These statements not evaluated by the United States Food and Drug Administration. This product is not intended to diagnose, treat, cure or prevent any disease. Competing bodybuilders seeking to add body mass and get as strong as you can in the quickest amount of time possible, this product delivers the result every time ! General Warning: Legal Steroids are powerful compounds. Users should never attempt to take more than the recommended dose in an attempt to facilitate faster more dramatic gains. Diandrol® used for the bulking cycle, to promote weight gain pill, muscle mass, muscle building. While improving over all muscular strength and power. Safety: Legal steroids non-methylated. That means safely metabolized by the body and do not pose any harm to your organs such as the liver or kidneys. If stacking multiple anabolic compounds for periods longer than 12 weeks. A basic milk thistle or liver guard product recommended. 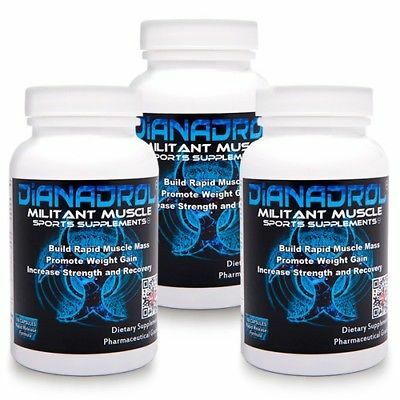 Dianadrol by Militant Muscle is the perfect legal steroid alternative for building muscle and strength!